An interactive electronic learning robot that helps prepare preschoolers for school by teaching cognitive, social and physical skills. Kasey features more than 40 activities including pre-reading, math, music, and manners. Kasey also encourages physical play like dancing and stretching. 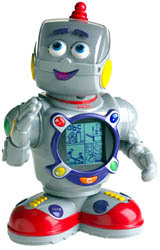 This robotic friend truly comes to life through animated motion (his antenna, eyes, hear, arms, and waist all move), flashing mouth, and interactive display screen. Additional ROM packs are available to increase the learning and fun.